The international association World Carfree Network (hereinafter, the Global Network) is hereby created. a) World Carfree Network as a whole does not currently have legal status. However, it does exist as a living, functioning global network. b) The WCN Global Network is run by an International Coordination Centre (ICC). This ICC should be a registered, legal body. See Article 7.
c) World Carfree Network Europe o.s. is a European organisation registered in the Czech Republic, and currently runs the ICC in Prague. World Carfree Network is the hub of the global carfree movement, promoting alternatives to car dependence and automobile-based planning, and working to improve quality of life for all. b) to amplify the impact of local, regional and national organisations promoting the above. a) Prospective Member Organisations sign the Network's charter and send it in to the International Coordination Centre to officially join the Network. By signing they agree to abide by both the charter and these statutes. 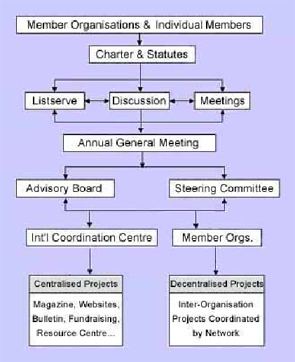 b) The Steering Committee, with input from the ICC, determines whether an organisation may become a Member Organisation, based solely on whether the organisation's policies and practices are consistent with those of the Network. Applications are to be reviewed within 60 days. attend the Network's Annual General Meeting, or submit written input on pertinent matters of Network development/direction in advance of the meeting. discounted bulk orders on Network publications and resources. the Organisation's representatives are determined to be seriously and deliberately disrupting the Network's decision-making processes. f) In cases of undue harm to the Network, the Steering Committee may remove a disruptive Member Organisation with immediate effect. a) Individual Members are those actively involved in the network but not associated with a Member Organisation. Individual Members support the network financially by joining at any of several levels and/or participate in the Network�s projects and other activities. Those who cannot afford to pay may request free membership. b) Individual Members are not required to sign and send in the charter in order to become involved in the network. They must however read and consent to the network charter and these statutes. c) In order for an Individual Member to maintain his or her membership status, Individual Members must pay the applicable annual membership fee. Fee exemptions may be requested in cases of demonstrable hardship. assisting the ICC in its coordinating tasks related to Network projects, fundraising, administration and outreach. priority for any Network event travel reimbursement funds. f) In cases of undue harm to the Network, the Steering Committee may remove a disruptive Individual Member with immediate effect. g) Carbusters magazine subscribers are not automatically Individual Members of the Network. a) The network is coordinated by an International Coordination Centre (hereinafter, ICC). This role is currently fulfilled by World Carfree Network Europe o.s., located at Kratka 26, 100 00 Prague 10, Czech Republic. Only the AGM has the power to transfer the ICC to another organisation or group of people in any geographic location. b) To comply with national legislation regarding the registration of non-profit organisations, the ICC may be run by an organisation which has its own board of directors or an equivalent legal body. That body does not have any decision-making power over the Global Network, but would be the legal entity held accountable in case of legal conflicts or actions in the country where the ICC organisation is registered. c) It is the role of the Global Network's Steering Committee - not the ICC's staff - to ensure that the ICC fulfills its ethical and project-related responsibilities to the Network, and operates according to the network's charter and statutes. However, the Steering Committee is not a financial oversight body. d) The ICC's staff and volunteers operate according to a consensus-based decision-making process of their choosing. At present, the ICC's Management Committee (see Statutes of the Association World Carfree Network Europe) makes decisions regarding hiring and firing of ICC staff. e) The ICC's primary responsibilities include project coordination, fundraising, administration and outreach. Projects to be coordinated include Network publications and websites, the Network's Resource Centre, and other projects as determined by the Network as a whole. The ICC is to regularly solicit comments from Network members concerning the development of its projects. f) A network project is defined as a project approved by the AGM or Steering Committee on the carfree theme, carried out by one or more Network Member Organisations and/or Individual Members and/or the ICC. g) The ICC does not have the power to determine that a new project must be centralised (ICC-coordinated), or to centralise a previously decentralised project. a) The network's Steering Committee serves to engage in strategic planning, make decisions throughout the year and give direction to the ICC, all based on consultation with Network Member Organisations and Individual Members. b) The Steering Committee must approve official WCN endorsement of any event or initiative, and cases where WCN as a whole would be joining another organisation or network. Similarly, the board of WCN Europe may endorse under that name. c) The AGM, not the Steering Committee, is the appropriate body to make major decisions affecting the network. The Steering Committee may however make decisions on major issues in cases where a delay until the next AGM would result in undue harm to the network. The AGM has the power to overturn decisions made by the Steering Committee. d) Steering Committee members and Steering Committee observers are chosen at the AGM. Prospective candidates shall be nominated by ICC staff, the Steering Committee and the Advisory Board via a Network mailing list or other discussion forum at least 30 days in advance of the AGM. Candidates are expected to provide information about themselves and their expected availability, enabling AGM participants to make informed decisions. being willing to take turns in facilitating and writing minutes from the meetings. f) In case a Steering Committee member is not able to meet these conditions and there is another suitable observer or candidate, the Steering Committee member should step down, or may be asked to do so by a majority of the remaining Steering Committee members. g) The number of Steering Committee members must be an odd number between 7 and 13 people. Geographic and gender balance should be maintained. Each Steering Committee member must be either a member of a WCN Member Organisation (no more than one Steering Committee member per Member Organisation) or a WCN Individual Member. h) There may be up to three additional Steering Committee observers without decision-making powers. Observers must also be a member of a WCN Member Organisation or a WCN Individual Member. The position is intended for those who have a strong interest in WCN matters but cannot commit as fully as is expected of a Steering Committee member. i) Steering Committee members and observers are appointed for a two-year term. j) In the event that a Steering Committee member resigns between AGMs, the Steering Committee may replace the outgoing member with a Steering Committee observer to fill the remainder of the term. If this is unsuccessful, replacements to serve until the next AGM may be suggested by Member Organisations, Individual Members, ICC staff, the Steering Committee and/or the Advisory Board. The final decision shall be made by Steering Committee. k) One and not more than one Steering Committee member will be a member of the ICC staff. The ICC member is a full voting member of the Steering Committee and is appointed subject to approval at the AGM. If the Steering Committee representative of the ICC leaves his/her job between AGMs, the Steering Committee will appoint an ICC member to fill the remainder of the term. l) A quorum � the minimum number of Steering Committee members necessary to make a decision is half the number of Steering Committee members, rounded up to the nearest whole number. For example, if there are seven Steering Committee members, the quorum is four. m) In conjunction with the ICC, the Steering Committee will be responsible for choosing press contacts. The press contacts are not official spokespeople of the Network. n) The Steering Committee will select, from among the proposals received, the organisation to host a Towards Carfree Cities conference. The proposals will be submitted to the Network's discussion list(s) for non-binding discussion. The Steering Committee may seek assistance with the evaluation of proposals but retains sole responsibility for the final selection. a) The network's Advisory Board - consisting no more than 20 well-known, respected individuals in the carfree movement - serves to provide additional input and non-binding recommendations as needed, but not on behalf of any member organisation. b) There is no fixed term: Advisory Board members are appointed and removed by decision of the Annual General Meeting. appointment of Steering Committee members and observers, and Advisory Board members as appropriate. b) Attendance will be open to all representatives of Member Organisations and provisional Member Organisations, Active Individual Members, ICC staff, Steering Committee members and Advisory Board members. However, no more than five representatives from a single Member Organisation may take part in decision-making. The meeting process should allow, to the greatest extent possible, for the participation of Members unable to attend in person. c) At the AGM, ICC staff,members of the Steering Committee and Advisory Board have equal decision-making powers to all other attendees in accordance with article 10b. d) Decisions that can only be made at the AGM include transfer of the ICC, dissolution of the Network and changes to the structure and level of membership fees. The significant modification of these statutes may only be ratified at the AGM, with the exception that the Steering Committee may make amendments to articles that would otherwise result in undue harm to the Network. e) A specific consensus-based decision-making process to be used at the AGM must be chosen by the Steering Committee at least 60 days prior to the meeting. f) If feasible financially and otherwise, trained, experienced and impartial facilitators will be utilised to run the meeting. g) In collaboration with the ICC, the Steering Committee will circulate a draft agenda for comment at least 60 days in advance to all Member Organisations, Active Individual Members and Advisory Board members. A final agenda will be circulated at least 30 days in advance. h) Information pertaining to AGM agenda items should be circulated at least 30 days in advance, but discussion should be encouraged throughout the year by means of facilitated and moderated Internet discussion fora. Decision-making on selected topics � using the method specified in article 10e � may take place therein: minor decisions (those which are not covered under 10d) may require no further debate, while others may be provisional and subject to final ratification at the AGM. i) One or more members of the Steering Committee or ICC take minutes at the AGM, which are then signed by all members of the (incoming) Steering Committee. j) Outside of the AGM, decisions regarding decentralised Network projects are to be made by the project coordinators and partners in collaboration with the ICC. The staff of the ICC make decisions regarding centralised (ICC-coordinated) projects. a) In an emergency situation, an Extraordinary General Meeting may be called by the Steering Committee, the ICC or the Advisory Board. b) Notice of the meeting must be circulated, by the body which called the meeting, to all Network Member Organisations, Individual Members and official Network bodies at least 30 days in advance. In cases of undue harm to the Network this notice period may be reduced. c) The Extraordinary General Meeting decides only on those issues for which it was called. Procedural rules are as described for the AGM (articles 10b, c, d, f and i), and a consensus-based decision-making process shall be approved by the Steering Committee. Communication and informal input/discussion take place on the network's Internet discussion lists, at various international meetings, and in other fora. The ICC will publish minutes of its meetings. The Steering Committee will publish the minutes of its meetings and decisions. This information will be available to WCN Member Organisations and Individual Members only. The Network ceases to exist by decision of the AGM. This decision can only be made if the item was listed in the AGM's agenda, and if the agenda was distributed in advance as outlined in Article 10. Should the AGM decide to terminate the Network's existence, the AGM then decides on the method of settlement of accounts and the transfer of the Network�s assets and property to another non-profit, non-governmental organisation whose mission is close to the aims of the Network. The assets and property of the network must be dispersed solely for non-profit purposes and may not be distributed to individuals.